The title of this article is ambiguous. Elite (Disambiguation). Elite Systems Ltd. (short: Elite) is game developing enterprise from Great Britain founded in 1984. It gained special profile, because it converted arcade games to home computers in series. Elite Systems was one of the first companies, that published computer games with film and TV licenses. In 1986 Elite System was voted Software House of the Year by the British Computer & Video Games magazine (Golden Joystick Award). In 1988 Paperboy was voted Game of the Year by the British software industry. Bestsellers and classic computer games was also published by the low budget labels Encore and HIT-PAK again. In 1990 Elite Systems was one of the first European companies to enter business relationship with Nintendo to produce for their hardware. In 1995 it was also one of the first European companies producing for the Playstation. Since 2002 Elite Systems develops for mobile devices as mobile phones and PDAs. 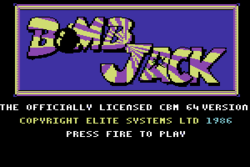 "Bomb Jack" with text ELITE SYSTEMS. Logo of ELITE in "Ghosts'n Goblins". This page was last modified on 16 January 2017, at 08:12. This page has been accessed 3,048 times.